Partly sunny. Late shower or storm. Temperatures near 80. It was another gorgeous day across the area with highs stretching into the lower 80s under plenty of sunshine. As we head into this evening, clouds will build in from the southwest as the leading edge of cloud cover and showers associated with once Hurricane Irma, slide in late tonight. Remnants of Irma will also merge with a cold front from Canada, allowing for the possibility of a few rumbles of thunder. These will be mainly into western New England as these storms diffuse as they march across the area. There are still chances for showers into Thursday, but these will be mainly in the morning, with breaks of sun, highs near 80. We could see a few more heavier downpours at times in the afternoon and evening across northern and western New England. This passing cold front may stall over southern New England by Friday, so, expect to see showers around Boston to end the work week with a possibility of a thunderstorm. High temperatures Friday will only stretch into the upper 70s. 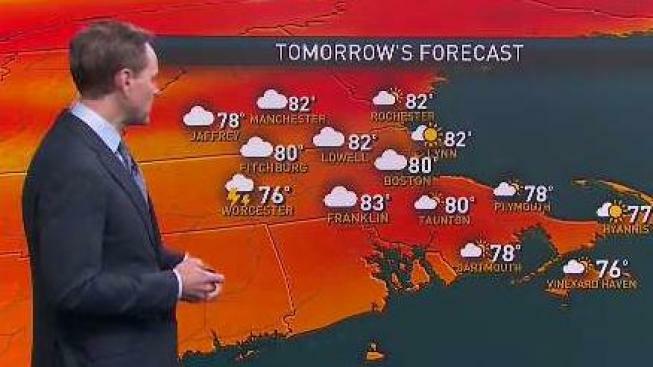 If the stalled front sticks around into Saturday, we could see a lingering shower into the first half of the weekend south of the Massachusetts Turnpike, but most will be a day filled with a mix of sun and clouds, leading into a beautiful Sunday — great for any of those outdoor fall-themed plans with highs into the 70s both days under mostly sunny skies. We’re still watching the Hurricane Jose as it meanders around the central Atlantic. Looking into the weekend, Jose will weaken as it curves its way northward, between Bermuda and the east coast as a Tropical Storm. We’ll likely see higher wave heights and rough seas into early next week. There’s still some uncertainty through the middle of next week with the track of Jose, so stay tuned.